A couple of posts back I wrote about my attempt to get news away quicker than I had been doing and my failed attempt using Press IPTC for Android. I spent considerable time on that App but couldn’t get it to work – I still haven’t. I looked at Shuttersnitch but was reluctant to go there as it seemed similar to Press IPTC albeit on iOS. Another App called Filterstorm looked interesting but it hadn’t been updated for a couple of years. It’s also in the back of my mind and its probably just me, but I’ve found that often some of these apps take me more time to set up and master than I’m going to save using them and I don’t submit to Alamy News all that often. Anyway Google was my friend and after a lot of reading on the App store I’ve found two relatively simple apps that seem to be more or less what I want – MetaGear and Easy FTP. Metagear allows batch edit of IPTC and Easy FTP to send the pics off. There are many FTP Apps available but not all seemed as intuitive to use as Easy FTP. Again probably me rather than the Apps. 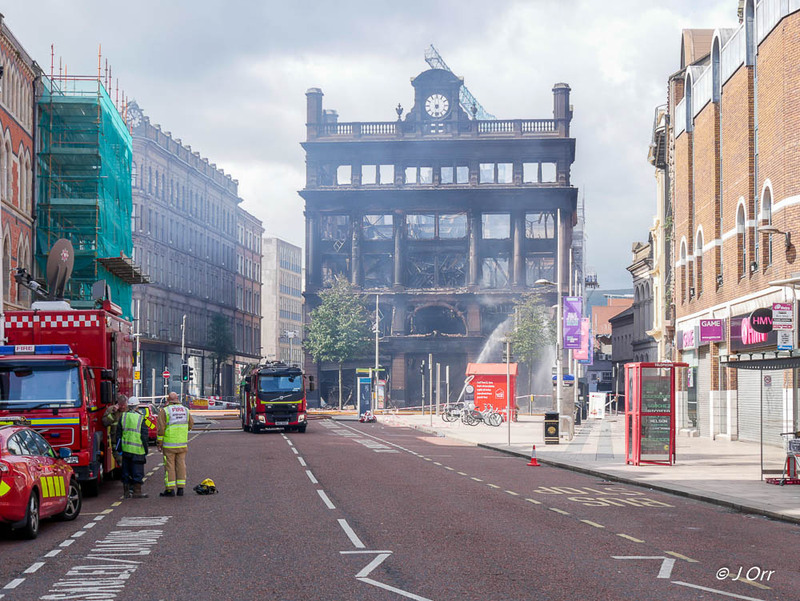 I tried my new workflow out the day after a fire at the Primark Store in Belfast. 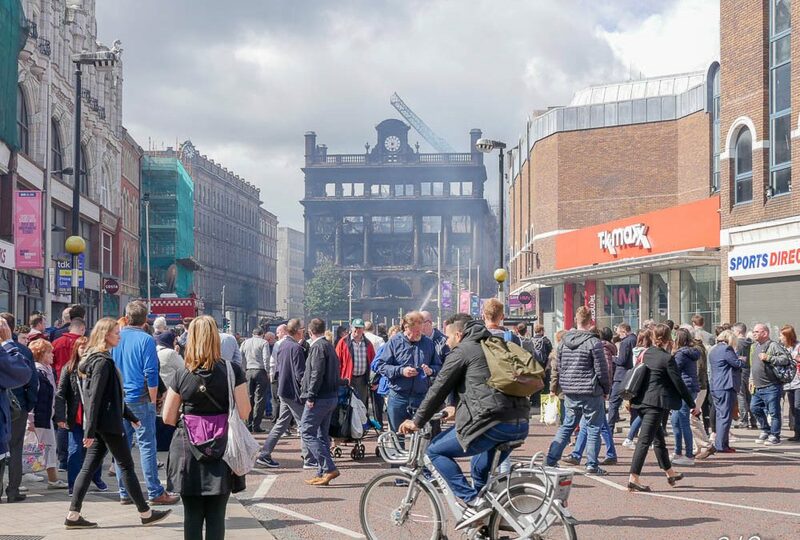 The building had very badly damaged and the Fire Brigade were still there the next day. I photographed the damaged building and went off in the direction of Starbucks to work on making a selection and sending them off. This presented a problem, not with the workflow as such but getting somewhere to sit to put the workflow into operation. Starbucks at lunch time is a very busy place with a queue and few seats. Indeed it was like that in all the coffee shops I tried. Back to the car again – where it all went reasonably smoothly and I managed to send four images to Alamy Live News. Although I’m happy now that I can use the iPad to send off images quickly it is far from ideal. A brief outline of my workflow follows. I selected photographs on the camera screen and transferred them to the iPad one by one using the Panasonic App. Images imported into the iPad go into the Camera Roll rather than where you would like them to go and for some reason they are renamed on import. This means when the images are imported into Lightroom Classic on my computer later it can be difficult to identify the specific images sent off from the iPad. After import to the iPad I have another quick look and import the keepers into Lightroom mobile. At this stage I delete the images from the Camera Roll. I straighten the photographs and possibly adjust the curves in Lightroom (I’m working with jpegs so they need little adjustment) and then export them back to the Camera Roll. This is why I deleted them earlier. Lightroom allows you to export images to Files on the iPad but as far as I can find Metagear will only work on images in the Camera Roll. I title, caption and keyword the photographs in Metagear and then send them off using Easy FTP with my iPad tethered to my phone. Surprisingly you don’t seem to be able to batch caption and keyword images in Lightroom Mobile and on export the keywords are removed anyway. Why you would want to keyword images and then export them without the keywords I can’t explain but the software seems designed that way. I’ve just read over the procedure above and there must be an easier way. The wish that you could use Photo Mechanic on an iPad was a sentiment I read often while researching this workflow but t I gather Camera Bits have no plans to go there. The iPad is a great piece of kit but for this its a grind. It may be I’m asking too much from it. The Apps don’t work well together and iOS doesn’t help. I’ve read that Lightroom will export fifteen images only at a time and others have experienced difficulty importing images with the Apple card reader. It feels that everything you want to do presents yet another problem that requires a workaround first. I have an iPad already so I’ll work with it. I may have another look at Shuttersnitch and Filterstorm depending on how often I use my iPad for processing photographs. From what I’ve read I believe that it may be possible with these apps to import photographs directly into Files on the iPad meaning, if I understand correctly, they wouldn’t get renamed. Both Apps may also be able to connect directly to my camera, Filterstorm has some editing capabilities and both have built in FTP thereby reducing the number of Apps I need to use. Whether these points are enough to overcome the sentiments I have outlined in the first paragraph remains to be seen. If I was starting from scratch however I’d be looking at a Surface Pro or a MacBook Air with Photo Mechanic. If anyone has any observations or views I’d be very grateful to read them.